You may notice that on the top page of the Lunar Mandala Calendar there are little symbols next to the date every 2-3 days or so. These symbols represent the signs of the zodiac that the moon is moving through. Traditionally the signs of the zodiac, or Zoidion, were regarded as the homes of the planets. Each planet has a sign or two that is its home. Different planets are also said to have dignity in the houses of other planets, for instance, Mars is exalted in Saturn's home of Capricorn and the Moon is exalted in Venus' sign of Taurus. When reading a natal chart, looking at what dignity a planet has can give information as to how much strength a planet has to be themselves within the context of a person's life. The moon is the fastest and swiftest moving planet in the sky. She moves from sign to sign about every 2.5 days. 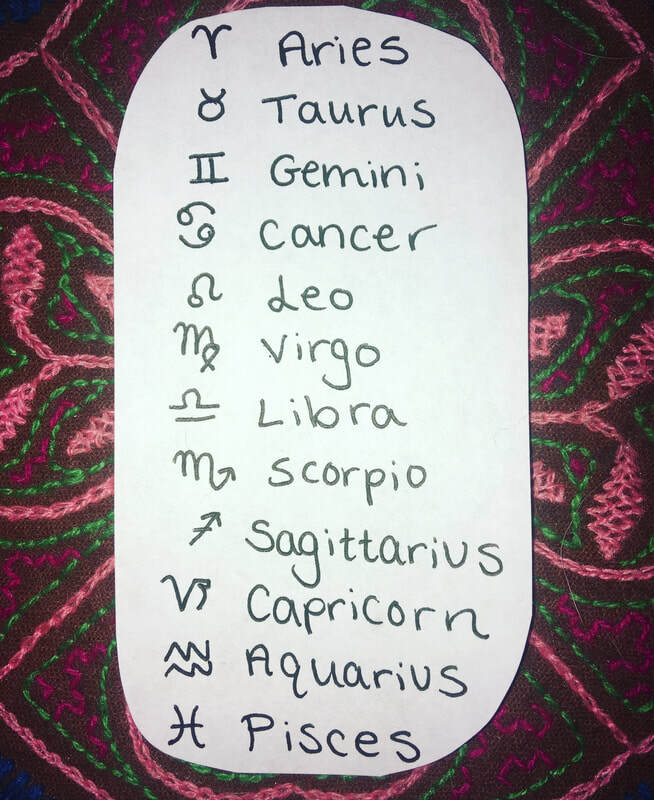 Tracking her movement through the signs, as well as the aspects she makes with other planets, can provide a qualitative picture of what type of energy to expect day-to-day. Below you will find a diagram of the zodiacal symbols and the signs they represent. If you don't already have the symbols memorized, take a few minutes to write your own key. The practice of writing the symbols down will help you memorize what they signify! How do I read a Lunar Calendar? Here's a super simple tutorial on how to read a Lunar Calendar. It may be easier than you think! ​If you have any questions, be sure to post them in the comments below! I am happy to guide you in reading your calendar. How do I set effective intentions with the New Moon? People are always asking me about the symbolism of the lunar cycles and what the rational is behind setting intentions on the new moon. Here is a super short and simple explanation of these two things. Of course there is more depth to the topic, but I wanted to offer a basic overview. Hope you enjoy! One last piece I forgot to mention in the video is that it's the really simple things we do everyday that can have profound impact on our lives. It is AMAZING how simple things like drinking enough water, getting enough sleep, and getting to bed on time can do for a person's sense of vibrancy, self-worth, grounded-ness, and well-being! If we take the time do intend to do one thing that nourishes us for one cycle, and then another, and another, these little cycles of self-kindness can bring deep nourishment in the long run. 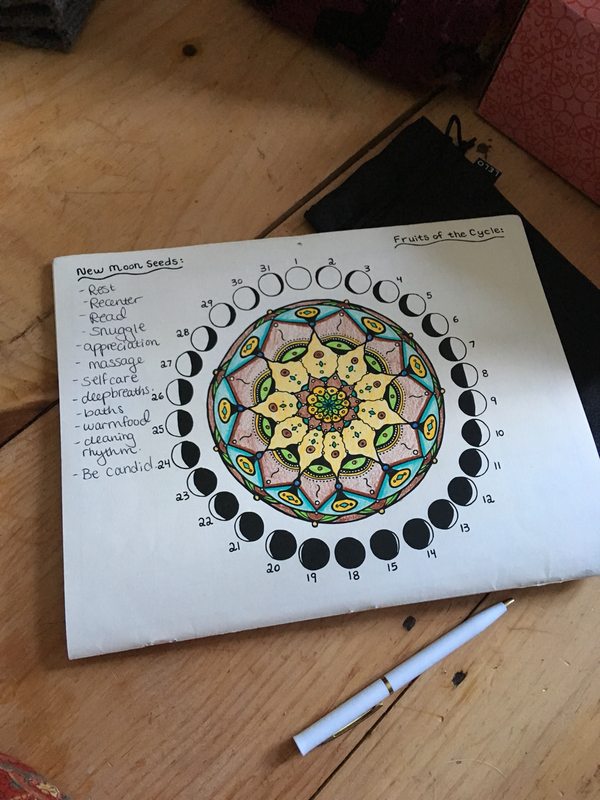 I've been asked to make some short videos describing some of the ways that I incorporate the Lunar Mandala Calendar into my daily life. Here is the first in a series. There are many ways to work with the moon's cycle in your life. 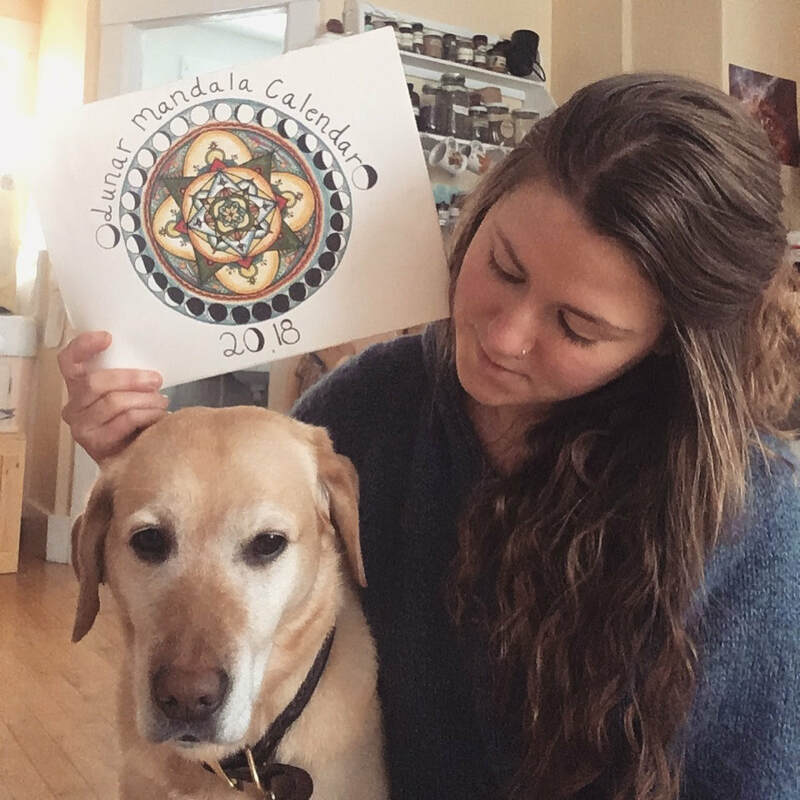 ​One of my favorite ways of working with my Lunar Mandala Calendar is in charting my menstruation. I take notes of the quality of my flow from month to month so that I can best support my body to come into better balance. Here's a short video describing some of my personal practice. Do you chart your cycle with the moon? Have you noticed a difference since you've started doing this? ​How do you like to tend to your menstrual health and wellness? I'd love to hear your stories! Leave a comment in the box below. Here's an audio blog sharing a couple stories of my experience flying recently. I flew on Venus' day (Friday) and Mars' day (Tuesday). I hope you enjoy listening and that these stories help illustrate the archetypes. -I am not suggesting the planets to have caused any occurrences nor am I suggesting that I had these experiences because it was Venus' day or because it was Mars' day. -Every day is different and flying on Venus' day this week will be different than flying on Venus' day next week. I am not implying that there is anything measurable or quantifiable about the planets influences on particular days of the week, but rather there may be a qualitative similarity between like days of the week. -There are many interacting factors going on in the sky all the time. The planetary rulers of the week are but one of many omens of what you may expect to see in your days. 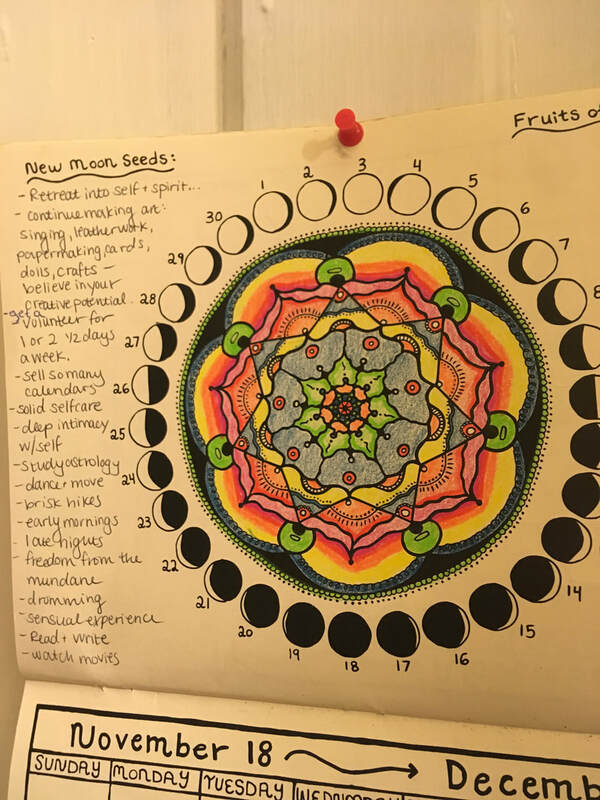 A common question people ask me when viewing the Lunar Mandala Calendar for the first time is: What do 'New Moon Seeds' and 'Fruits of the Cycle' mean? Simply put, these places are here for you to set intentions with the new moon and then to reflect on what happened, to give thanks for the blessings that graced your life. So, what is an intention? An intention is anything you can see, anything you can put your sight on, matched with the motivation to move towards that sight. It's something you'd like to see in your life. A goal, perhaps. A longing with directed focus as to how to actualize that longing. And why set intentions with the moon? The moon is the swiftest moving planet in the sky, zipping through each zoidion every two and a half days. Each month she grows from darkness into light and back again, her cycle averaging about 28 days. She is related to all things impermanent and passing - our emotions, physical states, thoughts, surges of creativity, our sensual expression - all things that we have in the moment and then are gone. The lunar cycle is a mini cycle of the seasons of the year. It begins in darkness (new moon/winter solstice), grows to half light (first quarter/spring equinox), then to complete brightness (full moon/summer solstice), half light (third quarter/fall equinox), and returns to darkness once more. In 28 days she completes a full cycle from birth to death. If we set intentions with the moon, we are aligning with this natural creation cycle each month. We are planting our visions in the dark and allowing them to grow and fade away as the moon reveals and conceals herself in the sky. I choose to set intentions with the moon in order to align my life with the moon's cycle. She reminds me that there is a time to expand and a time to contract, a time to be outward and a time to be inward, and that there is a wisdom in aligning our ebb and flow with hers. Setting intentions on the new moon can be an introspective opportunity for asking yourself, how can I more deeply honor my humanity in this coming cycle? What would I like to see more of in my life? What needs to come into balance? ​Does something need to be eliminated or initiated? How do I want to relate to my self-care? What are my body needs? ​What are my soul needs? What parts of my spirit are really needing expression and nourishment? Maybe I see images of hot baths, of spontaneous meetings with friends, of sensual dancing. Maybe I haven't made anything with my hands in a while, and want to set an intention around a creative project. Maybe I want to be more social, or be more alone, or more committed to my studies. Maybe I just need sleep or need to jump in the ocean or listen to new music. Or maybe I want to set a bunch of practical goal-oriented intentions and meet some deadlines. Trust whatever is unique to YOU. Vision your whole-life balance - if you could fill your life with whatever would most nourish your unique human expression, what would that be? What could that look like? There are no right or wrong ways to set intentions with the moon and there is no particular rhyme or reason to it. Do what feels right to you and you might expect that your relationship to this practice will fluctuate from month to month.